The Augusta City Council plans to honor the team at its Thursday meeting. 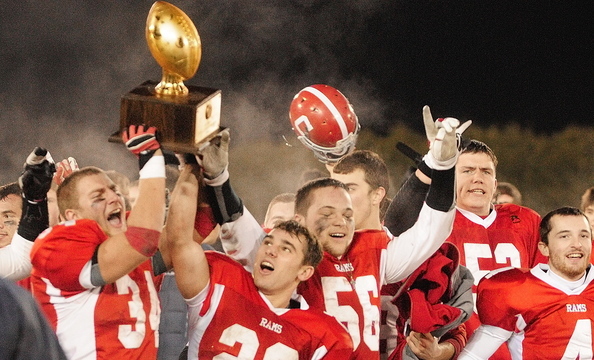 AUGUSTA — City councilors plan to honor the state champion Cony High School football team at their meeting Thursday. Last month, the Cony Rams varsity football team won the Class B state championship, defeating Kennebunk to take the school’s first title in the sport since 1932. City Manager William Bridgeo said officials look forward to congratulating the team for its historic win. Councilors are scheduled to recognize the team at their meeting at 7 p.m. Thursday in council chambers at Augusta City Center. Councilors are also scheduled to hear a presentation on the planned Dec. 16 opening of the Augusta Community Warming Center at 44 Front St., and consider accepting donations for the petanque courts at Mill Park and heating assistance for residents.